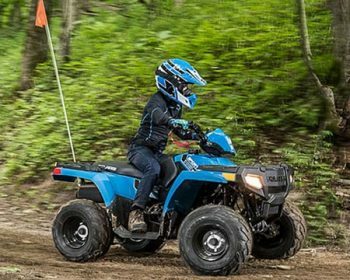 READY TO HIT THE TRAILS IN A NEW POLARIS ATV? 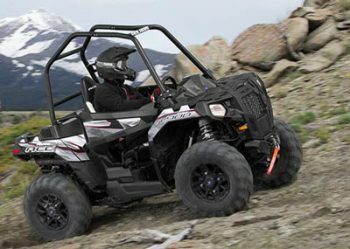 The Polaris Sportsman line and the Polaris Ace are known for their legendary ride and handling. Both come with several model size, as well as kid size versions for youngsters 10 and up. Family riding has never been such fun! The Sportsman ATV is the one you want for the biggest jobs an ATV can handle. And the Polaris Ace is compact and nimble, known for its fast ride and wild performance. Bring it on! The Sportsman is the hardest working lineup of ATVs you'll find. The ProStar® Engines offer options ranging from 31 HP – 89 HP. And the On-Demand True All-Wheel Drive (AWD) means four-wheel traction ready when it's needed or two wheel drive when it's not. Work or play, at home, on the farm, or on a the job site, Sportsman’s head-of-the-class towing and payload ratings mean you get the job done. Learn more about the Sportsman models. The Polaris Ace is packed with premium performance features. It takes on trails with a vengeance, but it does it with rider comfort in mind. The kid-sized Ace is the only single seat youth ATV with a full cab frame..The full-sized models have a 78 HP ProStar 900 ERI engine that really roars. You'll love the all new digital instrumentation with Bluetooth capacity. This is the model that is often bought in pairs so friends or couples can ride together but define their own riding experience. Learn more about the Polaris Ace.